CORPUS CHRISTI, TX – Solid Waste Services has added another least-wanted offender to the Recycling Bin’s Dirty Dozen lineup. His name is Pepperoni Pacino, also known as the dirty pizza box. Even though they are made of cardboard, pizza boxes are not easily recycled. When grease and food particles become absorbed in the box’s fibers, they interfere with the recycling process and should be tossed in the trash. Fortunately, if the top part of the box is grease-free, it can be torn off and placed in the blue bin with other clean recyclables. 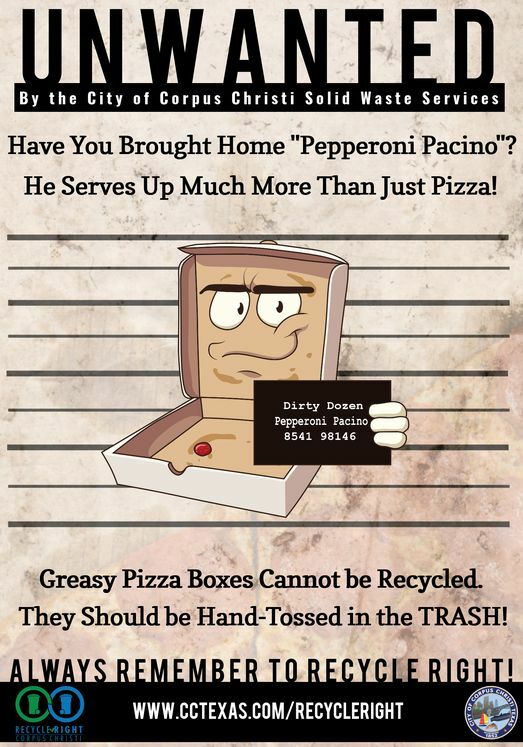 Pepperoni Pacino is the fifth character in the Recycle Right campaign and will be used to educate the public about how to properly dispose of dirty pizza boxes. Solid Waste Services and Communities in Schools are also using the Recycle Right campaign to educate CCISD students about the importance of recycling. Learn more about how you can Recycle Right by visiting www.cctexas/recycleright.